Nothing works better for reducing lag or increasing torque than nitrous oxide! Often a large turbo can be made to come on boost up to 1500rpm earlier with the addition of a NOS. 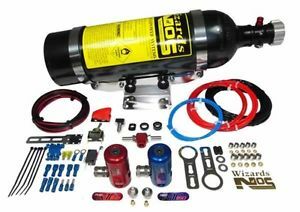 For most vehicles Nitrous oxide can be added without any major other modification required. For more information or suitability for your vehicle, don’t hesitate to contact us. Water/methanol injection is used on our high boost turbo cars as an extra form of air charge cooling and detonation control. We can install stand alone systems that use boost pressure as the primary control mechanism, through to ecu controlled systems where the volume of water/methonal is controlled by parameters such as rpm, boost and inlet air temperature, so that the correct amount can be injected. The primary advantage is the stability of the air charge temperature. In very high boost applications it’s not uncommon to see air temp continue to rise, especially under conditions such as top speed runs. In these situations we activate the water/methanol injection to only activate on high boost above air temps of 40DegC. Usually once activated the air charge temperature stays consistent with no further increase, giving far more protection during high speed runs as well as preventing further power loss. 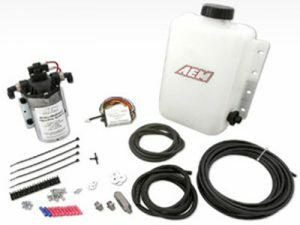 The system normally consists of a water/methanol tank mounted in the boot, a high pressure pump with small bore nylon line to transfer the water under pressure to a boost hose mounted injection nozel. A flow meter monitors liquid flow for accurate delivery.